Warm weather is here, which means that many people will soon be storing their winter coats and replacing them with swimsuits. With this in mind, it is important to consider the potential for injury with water-related activities since they can occur just as easily as other seasonal sports. As is most often the case, prevention is essential. Many of the tips for preventing summer sports-related back injuries revolve around being in good condition. You might be surprised at just what “conditioning” encompasses. Of course, maintaining a workout routine that includes the strengthening and stretching of your muscles will help protect your back — your back is vulnerable when the rest of your body cannot move easily and safely. But experts tell us that conditioning does not stop after you walk out of the gym. Align Your Body: Alignment refers to the relationships of parts of the body to the whole. Here’s how it works: Bones come together at joints, which are spaces that allow for movements you make when you run, hike, cycle, lift weights, or even type at your computer. For example, your knee is a joint, as is your elbow. Muscles do the work of moving those bones. With 26 movable bones; the spine has many joints that allow you to move it in several directions. When each bone is centered with the next, your muscles can focus their power on engaging in your sport instead of trying to hold your bones together. Pre-activity stretching can help to prevent soreness and injury; emphasis should be placed on the back of the shoulder, pectoral and latissumus muscles, as well as the legs as a whole. 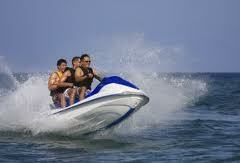 If you plan to participate in water-skiing, jet skiing, or other highly physical activities, plan to start a weight training program for the shoulders, upper/ mid back, core, and legs at least 6-8 weeks before the start of the season. 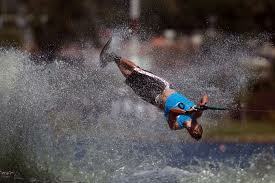 Participants in triathlons or open water swimming events need to acclimate themselves to the lake environment. This should involve at least 3-4 supervised lake training swims to become familiar with the poor visibility lake water as well as other influential factors such as wind and colder water temperatures. Lastly, it’s always advised to consult your primary care provider before starting any exercise program, especially if you’ve experienced a significant change in your health status over the winter months.